Compact, durable and effortless to open, the M&P M.A.G.I.C. 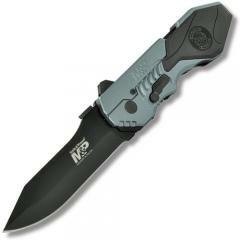 Black Assisted Folding Knife from Smith & Wesson is a one of kind utility knife. Featuring a powerful assisted-opening mechanism and ambidextrous thumb studs, the M.A.G.I.C. Knife is the easiest, one-handed opening blade on the market. A light tap of the thumb deploys the 4034 steel forged blade, revealing a machine-sharpened edge that means business. The handle is ergonomically shaped to match the contours of the hand and features Zytel® onlays to deliver an unbreakable grip the holds up in the worst of environmental and field conditions. Built with the needs tactical professionals in mind, the handle utilizes an integrated glass breaker tip that easily shatters windows and delivers devastating melee blows.